Sussex Police has welcomed a further 38 new recruits. 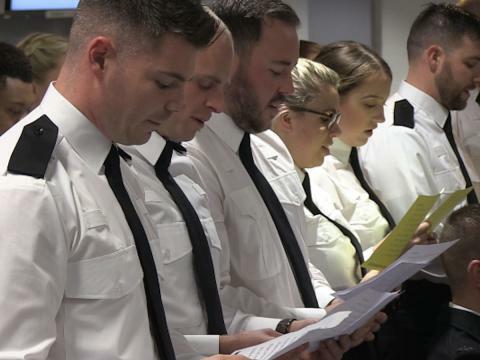 This latest intake sworn in on Wednesday (December 5) boosts the total number of new constables this year to 208, much of the recruitment made possible by this year’s rise in council tax. Chief Constable Giles York and Sussex Police and Crime Commissioner Katy Bourne welcomed the new recruits in to the police family at their attestation ceremony at The Amex Stadium at Falmer and the start of their intensive 15 week course. They join our biggest intake of 70 officers who are completing their training at headquarters in Lewes before being seen out in the community with their tutors next month. Chief Constable Giles York said: “I am excited. The ceremony absolutely marks the beginning of a career for them and as the chief constable for Sussex Police, I want to be able to welcome them personally, launch them on their career and set really clear expectations, not only for me, not only for the force, but actually on behalf of the public as well. “The current recruitment profile for Sussex is game changing for us. Over the next four years we will be recruiting 800 new officers into the organisation. That's a growth of 200. PCC Katy Bourne said: “I’m really excited to watch them as they take their oath and swear allegiance to Sussex Police and to protect the people of Sussex in front of their family, their friends and their loved ones. It’s a really, really important moment for them, but also for the people of Sussex, because these are the new officers that in about three months’ time will be on the streets, protecting all of us and keeping us safe. “Having paid a bit more in local council tax, the residents in Sussex have been very clear saying they want more visible policing. The only way you get more visibility is to get more officers onto the streets.